We need a serious and sustained presidential conversation with the country about the new health care reform laws—or progressives risk losing ownership of this once-in-a-generation liberal reform. If you listen to people in focus group discussions right now, they are clueless about the most basic policies in the reforms, even though parts of the law are already in place, the exchanges are to be launched in October, and the law’s requirements and benefits will become fully operative in January. Yes, people know about college kids staying on their parents’ plans; some women notice they no longer pay for birth control; and some acknowledge a mysterious rebate check from insurance companies refunding excessive administrative costs to consumers. However, when we talk to Americans in focus groups around the country, nobody has heard anything about the impending state health care exchanges—now called, “the health insurance marketplace." Indeed, barely half of the uninsured know they will be required in six months to carry health insurance. And in the most recent national surveys, more people think their health insurance situation will be made worse by the impending changes. The inability of the president to fashion public clarity on his major policy initiatives is hardly confined to health care reform. The president rescued the economy from crisis and has nearly brought it back to a growth path but nobody in a focus group can answer the query, “what’s the president’s approach to the economy?”—except maybe spending. Of course, the president did a lot more tax cutting than spending, but that has been kept secret from ordinary citizens. This week, the president put the spotlight on the broken link between productivity and wages and how reversing that is central to restoring the economy and middle class. He did get traction in the election year and ultimately won a mandate to prioritize the middle class, but that has faded. We all know that a litany of sensible policies to help the middle class will die in the congressional killing fields and Washington will fall into the next epic fight over austerity or not-so-epic fight about the IRS or Bengazi or whatever. The president has laid out an impressive and probably effective approach on climate change, but the public will never be brought along, as the president will only intermittently reference the epic battle he has joined. It will be left to us and history to divine the common thread in his much less impressive approach to Syria, Egypt, and the 'Arab Spring,' as the president has decided affirmatively not to speak publicly on these events, supposedly emulating President Dwight Eisenhower’s approach, according to Peter Baker of The New York Times. With the public uncertain of the president's direction in so many areas, his approval rating has slid down to 45 percent in the polls, emboldening his critics. With the national news dominated by the travails of Anthony Weiner and Edward Snowden and the George Zimmerman jury verdict, it would be hard to get heard on the new health care law or anything else. But the White House has been tongue-tied on health care from the beginning, so there are more enduring reasons why the president has not made the case or educated the country about these major reforms. But with Republicans waging all out war to make it fail and some evidence they have successfully elevated public fears, the president has no choice—and he has told many of his allies he intends to do just that. The conservatives are right. Health care reform is the biggest use of government to reshape major parts of the economy, regulate business, create a new form of social insurance, restructure the distribution of public health, redistribute wealth and benefits, and create new rights since the passage of Medicare and Medicaid under Lyndon Johnson and Social Security under Franklin Roosevelt. Because Obama rejected a Canadian-style single-payer system or Medicare for all and instead built on the current private insurance system and expanded markets, progressives hardly considered the reforms progressive—even if they welcomed the very important changes. But it is now apparent under attacks from conservatives that the Affordable Care Act makes fundamental changes and takes the country into new territory. The American health care system had reached such an absurd, corrupt, inefficient, and immoral state that it could no longer be patched. Insurance premiums increased 119 percent in the decade before the financial collapse, and health care as a share of the economy grew to 16 percent—despite no evidence of better health outcomes. The link between a job and health insurance was broken. In the decade before the health care law was passed, the percentage of people with job-based health insurance dropped from 69 to 59 percent, while employers pushed more of their costs on to employees. Today, just one quarter of the new jobs for high school graduates offer health insurance. The health care reform creates a new system where large employers and individuals all have health insurance and where individuals and small businesses get substantial financial help to purchase it. It creates an on-line insurance marketplace in your state where individuals and small businesses will get expanded choices and lower costs, perhaps even dramatically lower costs. Medicaid and public health clinics are expanding to cover low-wage workers. This new system is paid for by a new tax on individual income over $200,000 a year. Insurance packages now must include an essential benefit package with no-co-pays for preventive services, and insurance companies can not take into consideration a person’s health, pre-existing conditions, chronic illnesses, or gender and cannot place life-time limits on care. But absent a commensurate “big deal” conversation, we are left with the hope that the law will sell itself as people see the benefits. Women and small businesses are on the edge financially and are acutely attentive to what they pay for health care. Women will pay less and see new coverage; those with health issues will suddenly be able to buy insurance; small businesses will soon see the big tax credits that discount insurance; people with chronic illnesses will be able to change jobs. They may be right that implementation reduces the opposition and raises support for the reforms—as we saw with the introduction of the prescription drug benefit for seniors. Opposition collapsed among all voters but particularly among seniors within three months of the new law. In a rehearsal of arguments from the battle for reform, the administration is re-assuring seniors and people with private health insurance that this law will have almost no affect on them. "For the 85 to 90 percent of Americans who already have health insurance, this thing has already happened," Obama said. "Their only impact is that their insurance is stronger, better, more secure than it was before. Full stop. That's it. They don't have to worry about anything else." If the goal is simply to get past this madness, patience might be right. A majority of voters in the NBC Wall Street Journal want Republicans to stop trying to repeal the law, and only a minority of voters in the competitive Republican held House seats want to repeal the law. Republican frenzy on ‘Obamacare’ failed in the 2012 presidential and Senate elections, and it will fail again. Still, that is not the right approach if you think we are about to keep the biggest progressive change a secret. 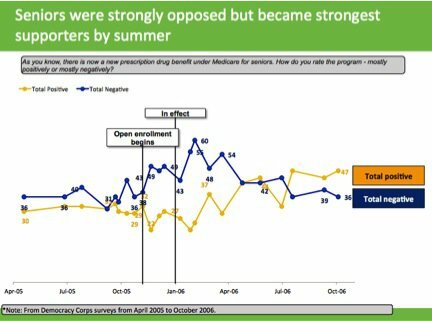 Ask President George W. Bush whether he got any enduring political benefit from the introduction of the prescription drug benefit for seniors. While Karl Rove hoped that it would become a key plank in Bush’s version of compassionate conservatism, it proved so unpopular and divisive in the Republican Party that they went silent on this new entitlement. There is no evidence that Republicans gained any advantage in society or with seniors as a consequence of these reforms. They probably got punished a bit because of the doughnut hole on out-of-pocket expenses. In fighting for its passage, almost all advocates for the Affordable Care Act reassured the already insured that the changes were small, and they need not feel threatened. That was probably right. But we have now watched the failure of health care reform to win broad support over three years, and you have to ask whether repeating the same mantra is the problem. Maybe it is time to elevate the changes and make them matter. As a start, the president should describe the health care changes as fundamental—making sure insurance is really insurance for everyone and creating a new, subsidized market place where individuals and small businesses are empowered. Perhaps if we signify rather than minimize the changes, voters will notice and defend it. People are hungry for information and the president should play the role of the educative fireside chat president who steps back from the fights and spends his time seemingly endlessly, giving people information about the new law and how they can take advantage of it. People are paying close attention now—and they will listen in this new, less political context when he jettisons the political lexicon of ‘Obamacare’. Without any real public debate or public engagement about the health care reforms, voters see the reforms as something descending from on high and something happening to them—not something they played any role in. But the president can urge people, health professionals, employers, and insurance companies to rise to a new level of personal and social responsibility. With expanded choice and health information, people can make healthier and more affordable choices. And the president has to take a lesson from FDR and LBJ who shifted the debate about the role of government and social insurance—and forced conservatives to accept core elements of the welfare state, until now. That is why educating on the benefits or allowing the benefits to speak for themselves is insufficient, politically and ideologically. The default distrust of government demands that the president create a framework for health care reform that makes these changes the right thing to do. This is the first time I find myself in agreement with George Lakoff who urged the president to talk about healthcare reform in big moral terms. He could embed it in the struggle of working people and the middle class and his responsibility to check the abuses that put them on the edge and unable to rise with a growing economy. The top 1 percent and CEOs have taken all the gains since the recovery and irresponsible companies are fighting these changes, but this health care reform is the chance for hard working people to get a break.